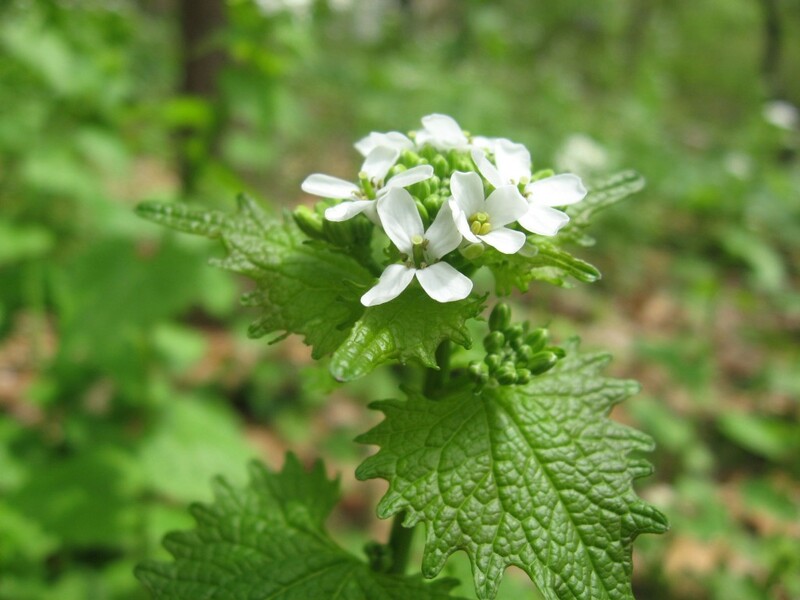 Are you tired of seeing Garlic Mustard? 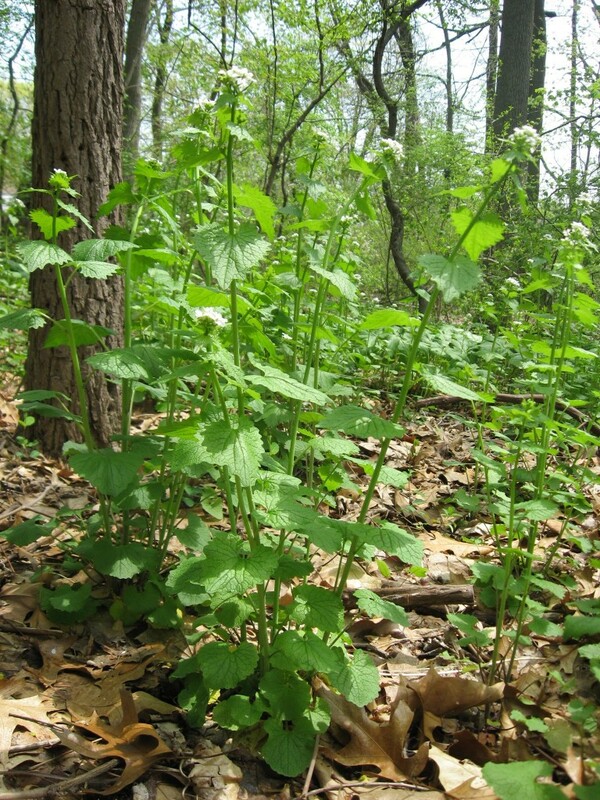 If so please visit our stewardship area of scope in Morris Park, Philadelphia, where you will see no Garlic Mustard. If we are around we will gladly give you a tour. If not, just walk along the trail starting at the end of Morris Park Road and you will not see any Garlic Mustard. Enjoy your walk and appreciate the wonderful variety of native, localized species of trees, herbaceous plants and shrubs in this once degraded patch of urban Forest! 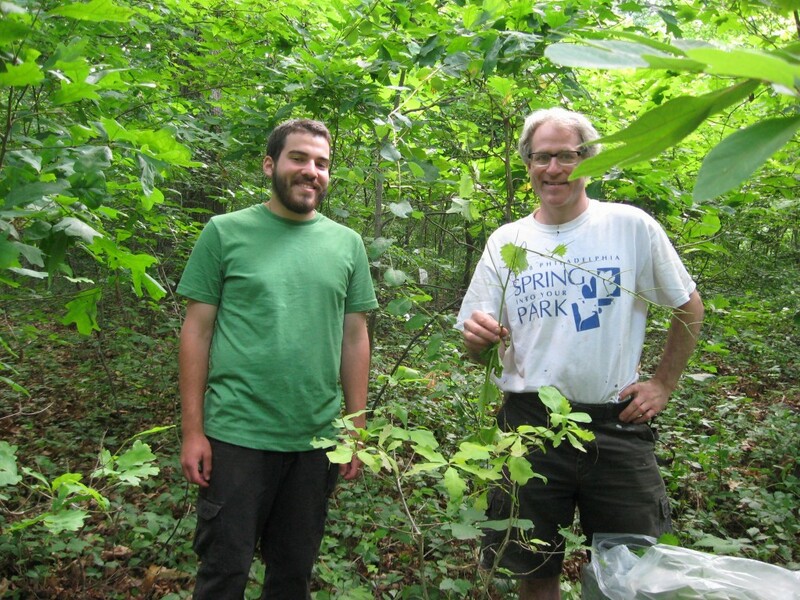 It’s been since 2006 that we started working on the infestations of Garlic Mustard in Morris Park. We have kept up with the efforts, yearly pulling in the same sites that we started at and expanding our area of scope to the point where we are satisfied with our progress, ever mindful of our limitations. Garlic Mustard: You cannot just pull one. Once you start it, you cannot stop year after year, area by area, and if you do not pull it out one year you will be canceling out the many hours of your work during the previous years. This is the reality of the seed bank depletion method of invasive control. Harsh as this may sound, this is a biological reality in the world of managing and controlling plants. This is Alliaria petiolata, the Garlic Mustard. So it’s been a long nine years removing Garlic Mustard from this site. What is our motivation? Why do we do it? What has changed and evolved on the site and will we keep doing it? How many hours have we spent? Our motivation is experimental and hopeful at the same time. We started out believing that removing Garlic Mustard was the thing to do. We continue to do it as we see the fantastic results. It really makes a difference. The Oaks (note the one above) and other trees are seeding themselves in and have enough of an advantage to continue to grow. More and more herbaceous native plants are growing in once invaded areas. There is less and less Garlic Mustard to pull every year, freeing ourselves up to do other things like visit other places or work on the garden. This year we pulled and trashed 31 bags, Last year we did 78 bags. This year about 30 hours of time spent. We hope to inspire anyone out there with Garlic Mustard to keep up the work, and be realistic in your area of scope so you can continue to go back year after year and follow through on depleting the seed bank. If anything you will learn your area and the habits of this plant quite well and have fun doing it! 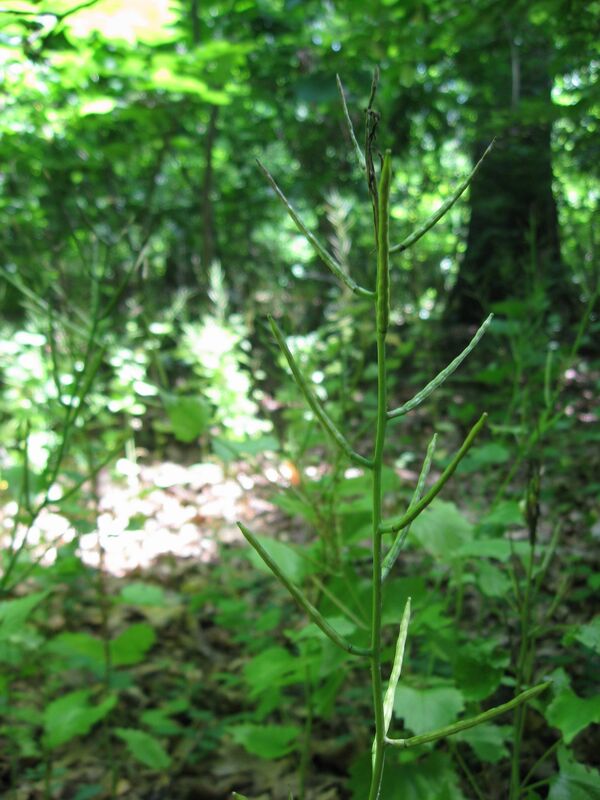 IT IS THE TIME TO REMOVE GARLIC MUSTARD AND TO DEPLETE ITS SEED BANK. ERADICATING THIS NOXIOUS INVASIVE WILL ENABLE YOUNG TREES TO GROW AND RESTORE THE DEGRADED CANOPY. 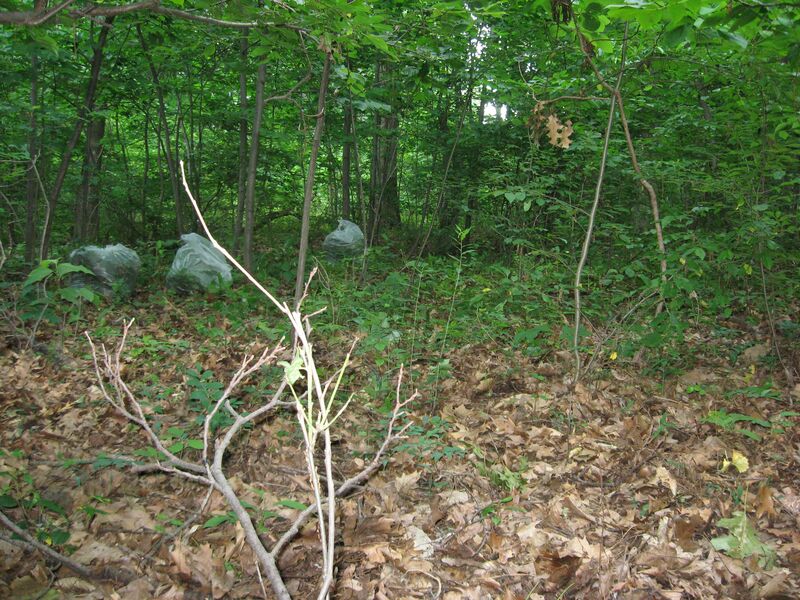 It will take us years to control this invasive in our modestly sized area of scope in Morris Park. However, it can be controlled with some persistence, and the results are gratifying. It may seem a daunting task, with thousands of plants that suddenly show up in your nearby forest landscape in the early spring, like the aliens that they are and they want to take over the herbaceous layer of the ecosystem. Even more insidiously, they will actually inhibit the growth of young trees by disturbing the beneficial Mycorrhizal bacteria that these trees need for their growth. We have actually experienced this phenomenon. There is one area we had been targeting the Garlic Mustard for eradication for 3 consecutive years now. Today we found a young oak sapling growing in this spot where we had been pulling the Garlic mustard. We had not found any such saplings in prior years. This area is also right next to a 200+ year old oak tree that has been dropping acorns year after, yet there are very few saplings to be found under it and it happens to be an area infested with Garlic mustard. Perhaps our work is paying off, and that we are creating an environment that is more conducive to young trees. We have heard that the Garlic mustard plant can throw out over one hundred seeds per specimen, and that these seeds can live from 5-7 years in the soil before germinating. So if we pull a plant out of the soil, there will be still be seeds in the soil that can germinate and grow into a new plant, 5-7 years down the road. However, there will have been no seeds created if we pull every possible plant we find in a given area, so in 8 years, we will not have any of these plants growing in the areas we have pulled them out. However, we have found that we can eradicate a very high percentage of an infestation in just three years, if we are thorough in our eradication strategy. There will still be some plants that will grow, just a few, which explains the 5-7 year seed bank reality. The few that do grow after 3 years require just a minute to remove, while it takes many hours to remove a one or two year old population. 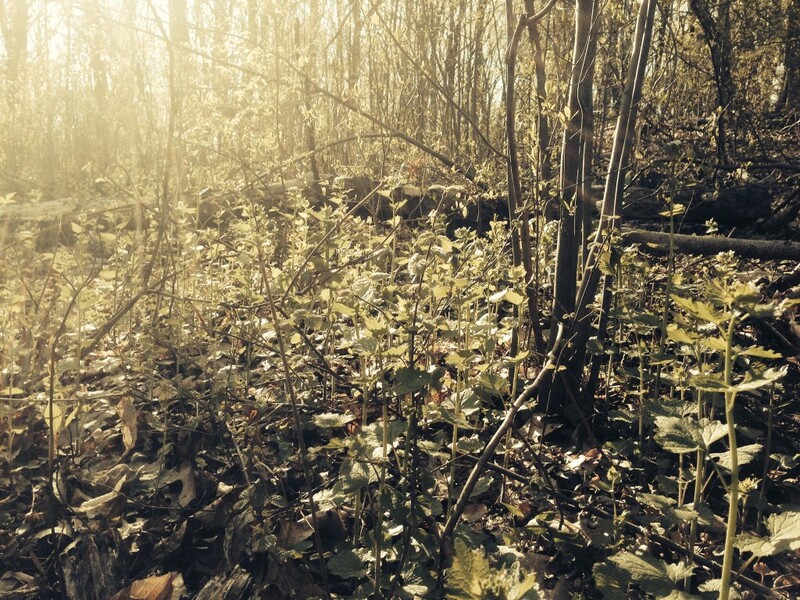 So from our experience, Garlic mustard is a manageable invasive. It is after all a biennial, which means that each specimen lives two years and then dies off. The plant relies on the hundred or more seeds produced in this two year life cycle to live on and spread. So the main objective in the long run is to prevent seed production or maturity, and most importantly, seed dispersal. However this long-term objective requires an attention to detail, a careful approach (so native plants are not crushed in the process), and a serious follow-through regimen. A pass of removal in April or May, should be re-inspected in June and July for missed specimens. There will always be a few plants that were overlooked in any given area, which if not removed will throw out 100s of seeds, prolonging the problem one more year if not up to 5 or 7 years. The plant can grow tall quickly. Removing it can be in some situations a drama as well. The root hooks to the side in the ground, making removal that much more difficult. However a gentle tug is the trick, and if the habit of the plant can be understood, the removal is all that much more easy. The removal also creates a disturbance in the soil, a very problematic and controversial issue when it comes to invasive control. The gentle tug is a key aspect of soil disturbance management and we make sure that the area of pulled Garlic mustard is left as close as possible to the way it was. 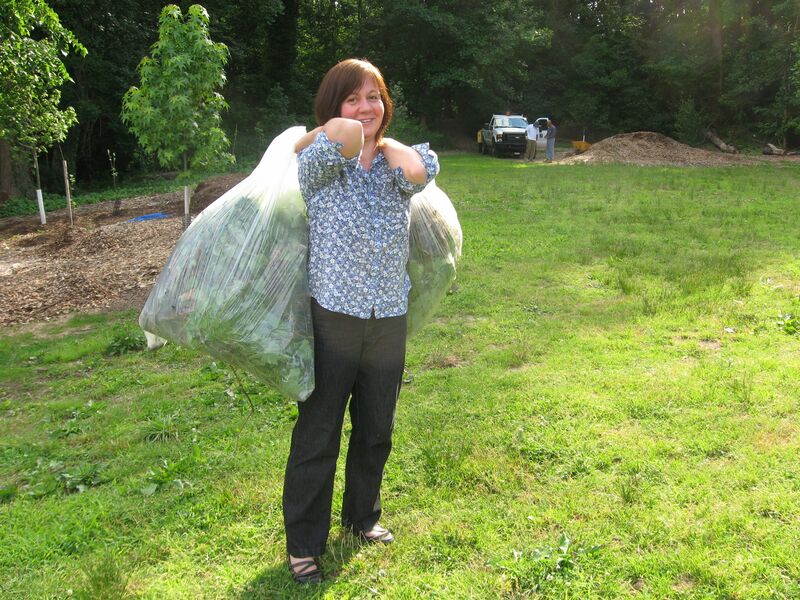 We push the soil back in place, and we put the leaf litter back, so that the area we removed Garlic mustard or any invasive for that matter is left as if the problematic plant was never there in the first place. The last thing we want to do is irreparably disturb an ecosystem in the process of trying to bring balance to that ecosystem. From our experience so far, the minor disturbances to the soil from removing Garlic mustard have actually had beneficial results. 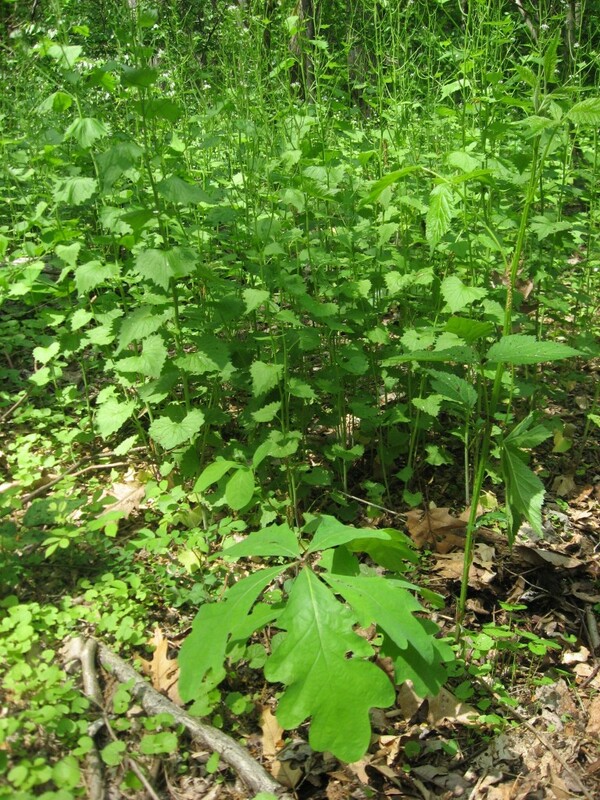 The seed banks of native species have been altered in the disturbance, and in areas of heavy Garlic mustard infestations, the eradication efforts have resulted in surprise appearances of Bloodroot (Sanguinaria canadensis) and False Solomon’s seal (Smilacina racemosa). With a highly invasive population in the process of eradication, the resulting soil disturbance is not necessarily a bad thing, a long as there is a serious follow through on the eradication process, done on a monthly basis. The native plant seed bank is also active, and is also responsive to minor soil disturbance. This little guy was completely surrounded with Garlic mustard and we found it as if it were an archeological discovery. The battle to save the oak sapling from the Garlic mustard has just begun, because next years crop is ready to take over, all around this sapling. 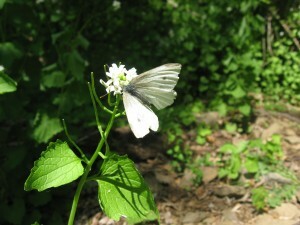 This European introduction, the Cabbage white (Artogeia rapae) has been very active around the Garlic mustard flowers. They are a European insect interacting with a European flower. 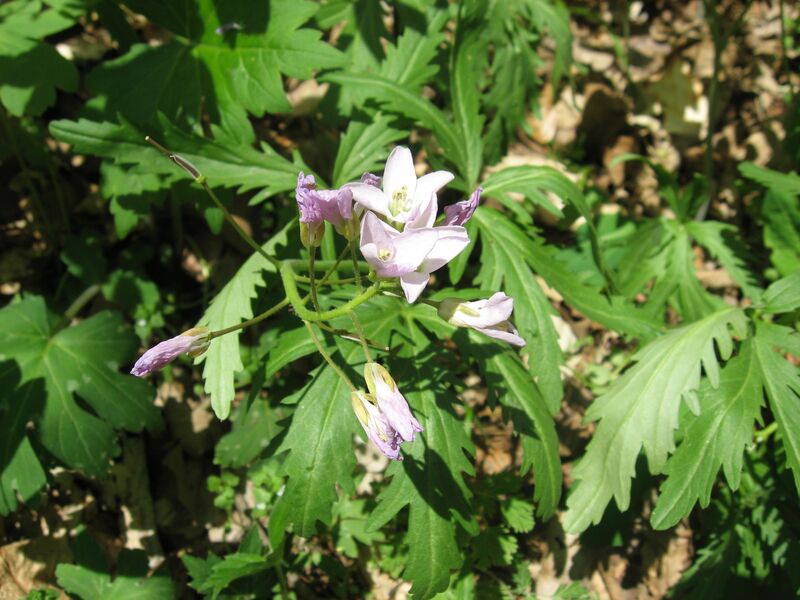 We thought that it might be the native West Virginia white butterfly mistaking it for a cut-leaved Toothwort , Cardamine concatenata (formerly Dentaria laciniata). This has become a problem for the West Virginia white , which lays its eggs on the Toothwort flower. Mistaking it for a Garlic mustard is deadly to the larvae, and so the Garlic mustard threatens this native butterfly, one more reason to control it. Any serious effort at environmental restoration will require a level of observation, action and follow through, almost on a daily basis, until the conditions are understood and can be managed based on a reasonable level of predictability. 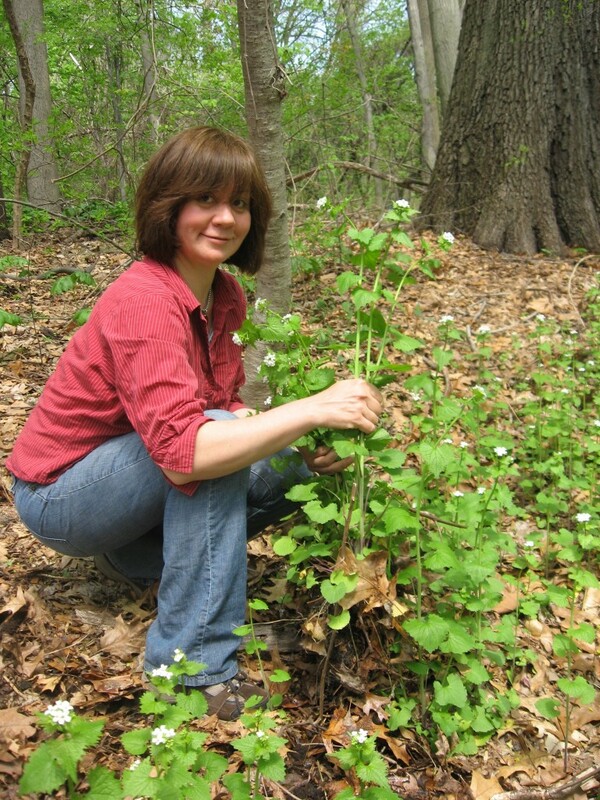 Pulling Garlic mustard is a long-term activity. If there is a fully established population, with thousands of specimens, and it has been decided upon to try to eradicate this invasive, there better be a long-term plan in place for effectiveness. The same site must be visited at least 3 times a season, because there are always specimens missed during the first and second passes. The plants that are pulled the first time around will not show a result for two years. The next year there will be just as many plants, which must be pulled as thoroughly as possible. The year after that there will be significantly less plants. However, the next year, year # 4, there may be a huge jump in plants, and this will be very discouraging to volunteers and land owners. This is the crucial year where it is easy to give up. The 4th year is actually the most important- one last round of pulling and the rest is an easy ride. By year five, the amount of plants will have been reduced significantly. The Sanguine Root has no experience after this and is unable to speak about what year 6 may be like. However we still have a lot to say about Garlic mustard. If you are struggling with Garlic mustard and are hanging on to every word of this post, please stay with us as we navigate through this complicated subject. What we have to say is more about seed production and cyclical germination than just plain eradication. In our view, the only way to rid an area of this species is by pulling. On our site there are so many native plants trying to grow amidst the garlic mustard, that pulling is a necessity. The pulling of this plant is as close as it gets to weeding in the gardening sense, and to the newly introduced volunteer in environmental restoration, Garlic mustard is a good ‘gateway’ invasive. 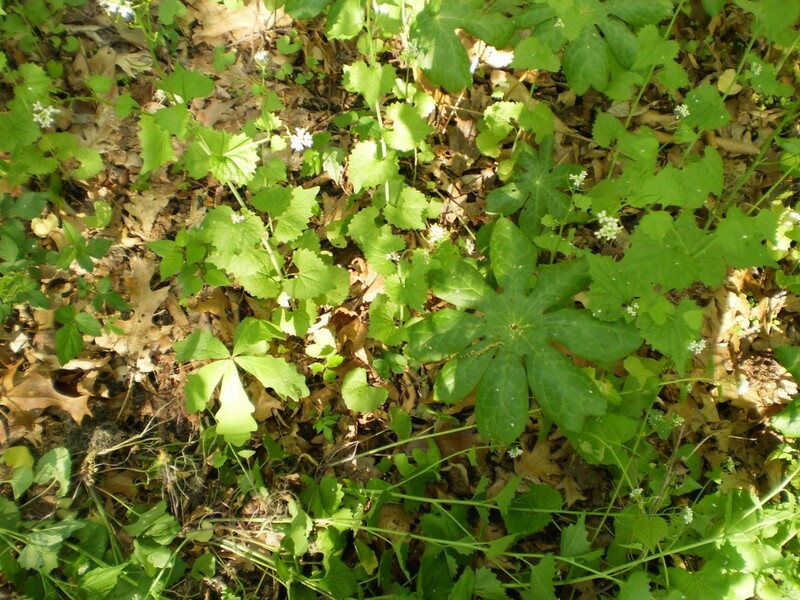 As this plant is pulled out from a native population of Spring beauties, Mayapples , Wild geranium, Black cohosh, Rattlesnake root and Bloodroot, it is easy to see how a forest floor can be transformed from an at-risk blighted state, to a pristine understory woodland ecosystem. And the next year, its more Garlic Mustard all over again. Just remember, each plant pulled is a 100 less seed producing plants in two or even 3, 4, 5, 6 years from now. Keep pulling! Here is where the passing of the years becomes an asset. As there is less and less Garlic mustard in your area, we become younger and more optimistic at heart, knowing we can do something to help native plants, and native birds, insects and animals survive in an increasingly difficult environment. Driving along roads, there is little consolation that this invasive will ever be controlled. But we can only worry about what we can have some control over. It is worth it to pull in your area. Just remember, there are hundreds and thousands of native plants that will benefit. Since we have successfully eradicated Garlic mustard in a just a few areas, there has been a dramatic increase in native plants. There are alot of reasons for this, and some are pure speculation and not based on any science. Just by removing the pure mass of these plants, has given the chance for the late spring sun to hit the leaf litter, warming it just that much more than it had been getting for the past who-knows-how-many years that the Garlic mustard has dominated the mid to late spring forest floor, allowing for the germination of native plants seeds that have been dormant, as well as more Garlic mustard seeds. ( This leads up to why year 4 of pulling is so crucial). 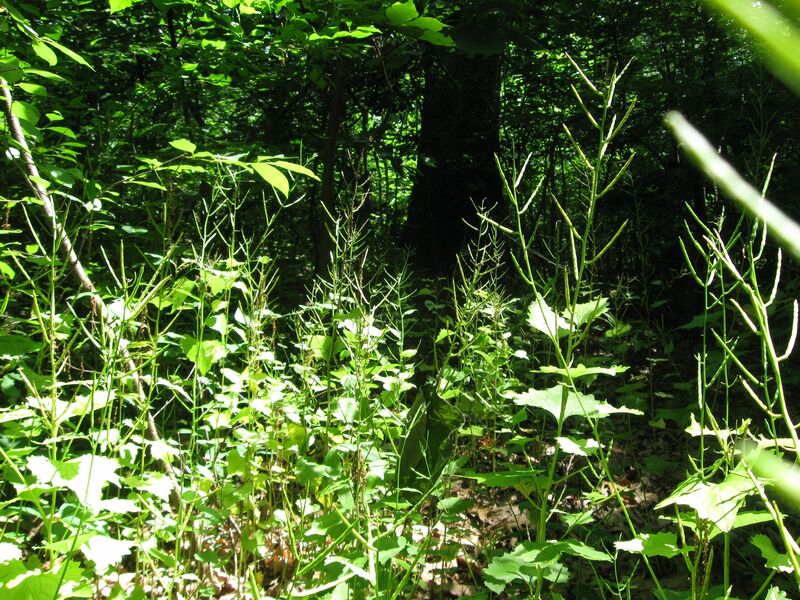 As briefly touched upon before, the very minor soil disturbance created by pulling a mature Garlic mustard plant in the first year of eradication attempts, may actually be beneficial to the ecosystem. 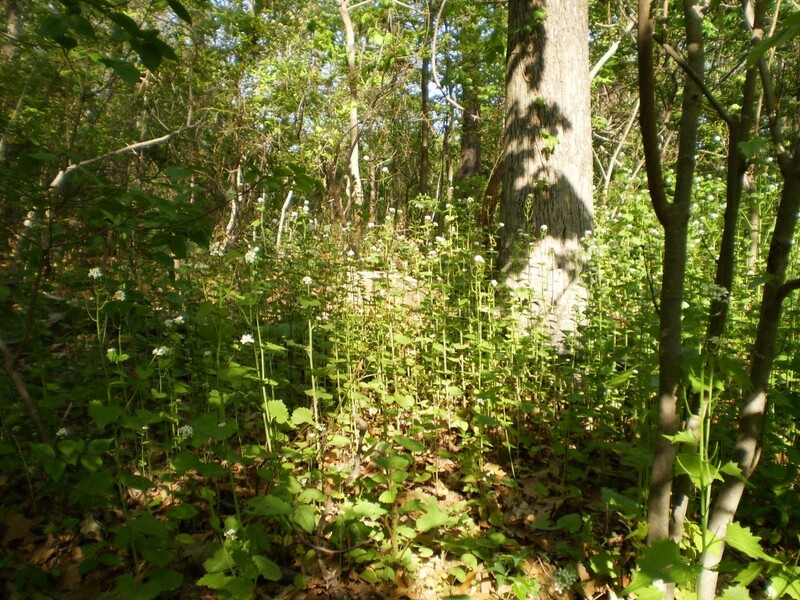 Heres our line of reasoning: The mature Garlic mustard plant is almost three feet tall and its roots consume about six square inches of soil about two to three inches down. When pulled by the Sanguine Root environmental restoration team, there is a gentle tug, and the plant is teased out of the soil. Upon removal, the plant is then shaken vigorously, to release all the soil attached to the root. This is done on the immediate site of removal, to prevent the spread of Garlic mustard seed, which is most likely in the soil. These seeds will germinate and produce plants which will be pulled in the following years. More importantly, there will be seeds of native woodland plants that will be shaken out and deposited on the slightly disturbed soil, that could possibly germinate and grow, immediately replacing the Garlic mustard and commencing the business of a forest floor ecosystem. The butterflies and birds of ten years from now, 2021, will very much appreciate the liberation of these native seeds now. All of this is pure speculation, the thoughts expressed from spending many many hours in the woods, year after year after year, pulling Garlic mustard. However, for us out in the field, on site on a daily basis, the rewards of Garlic mustard removal are showing their mark. We are finding native plants just growing on those sites, where we have not noticed them before. Either we were not fully aware of them before, or they started growing. The best time to pull Garlic mustard is when they are in flower. 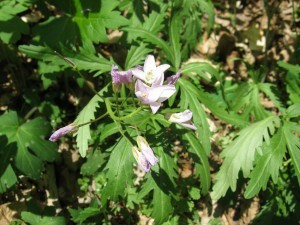 The bright white flowers help it stand out on the forest floor. Sad isnt it? Here is a plant that in its native Europe, is a beneficial plant to almost 70 species, and is fully active in its ecosystem. Yet here, it is detrimental and it has become noxious, destroying rather than contributing to ecosystems. When we consider the concept of a species, we must consider its ecosystem, its range. If any given species is removed from its range, it becomes a roll of the dice for many. Some will immediately wither and die. Some may grow and exhibit good behavior, and excel in cultivation. Some may immediately become noxious invasives. Some may exhibit good behavior for many years, and establish themselves as a reliable garden or landscape plant, only to suddenly “jump the fence”and become a virulent invasive. Of all of the introduced plants there are in our area, there is no way of knowing which ones will “jump the fence”. 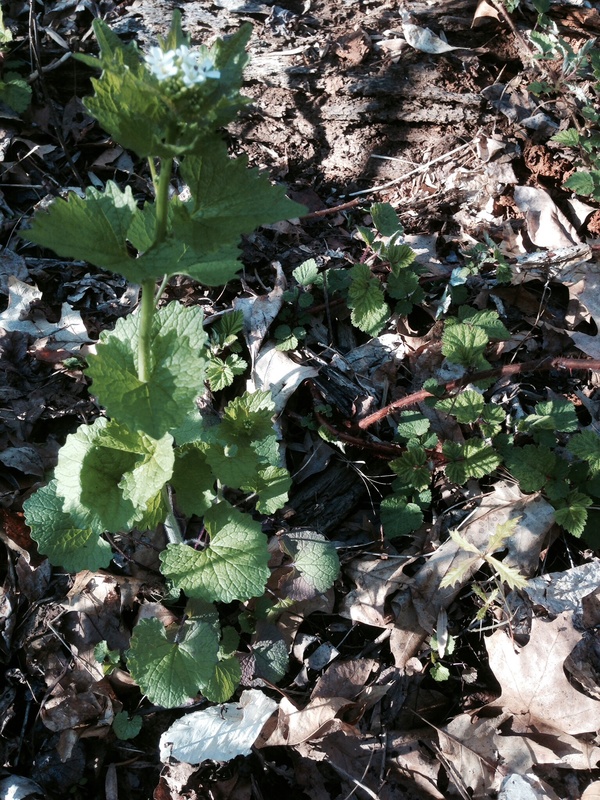 When pulling Garlic mustard , no matter what, there will be some that are overlooked and can grow and go to seed. That is why a second and third pass in any eradication effort is necessary for a thorough eradication for any given year. 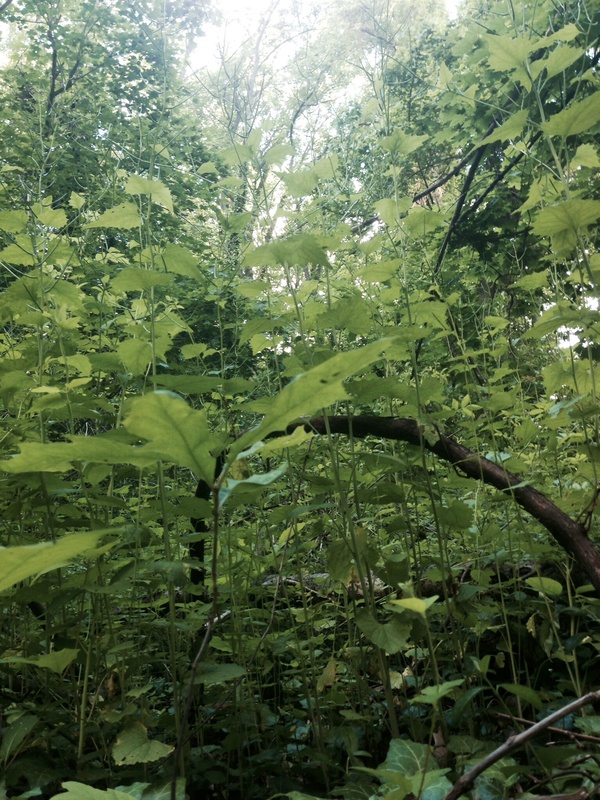 For us the ritual of pulling Garlic Mustard is an excuse to go off of the trails into the wildlands of Morris Park. While pulling Garlic mustard, we , at the same time, are able to take an inventory of other plants growing in these off the beaten path areas. 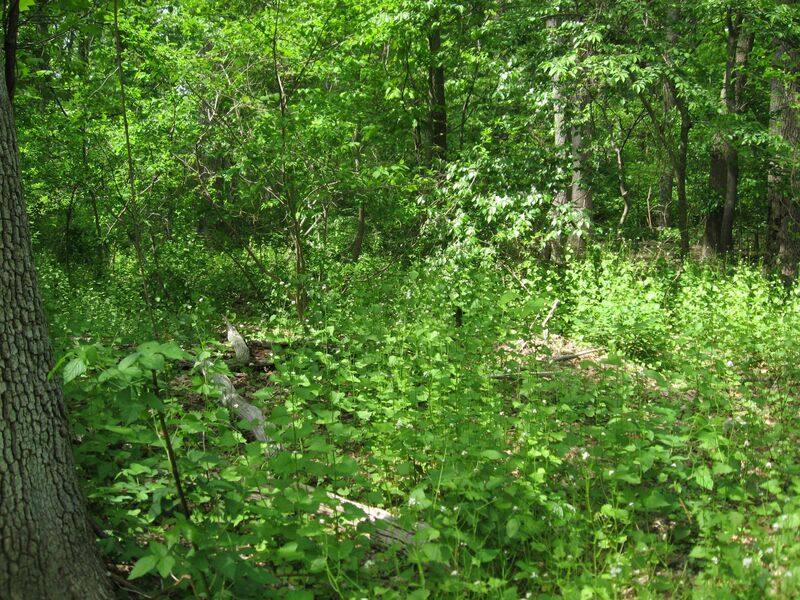 When pulling, we get a square foot by square foot view of any given area we target for Garlic mustard removal. Garlic mustard removal time is really a time of meditation as to what is growing and living in a given area. 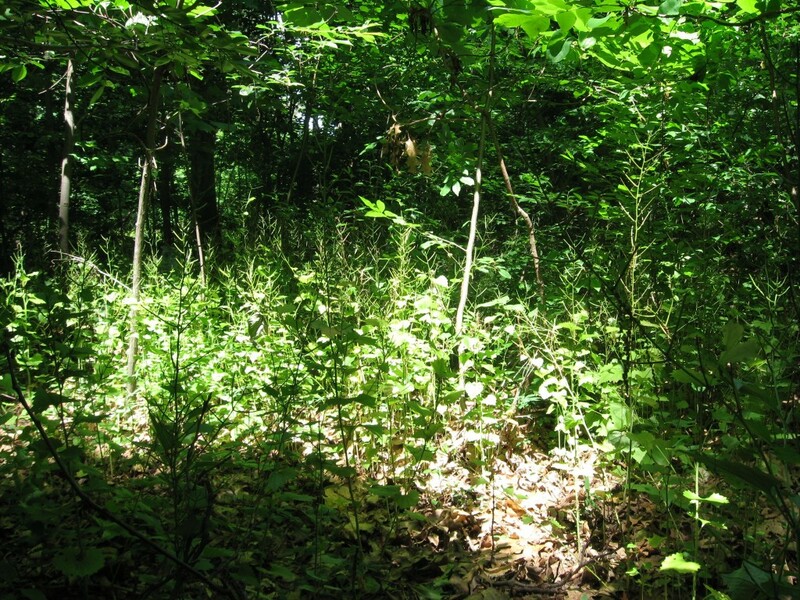 We generally reserve off-trail activity for official park business, which involves invasive removal and environmental restoration-oriented activities such as invasive plant and native plant inventories and just plain site assessment. The main reason for this is to have a minimum impact on the environment in these sensitive and stressed natural areas. Aside from disturbing native plants, we also do not want to disturb ground-nesting birds that may need the forest for their habitat. Final notes for the volunteer groups and the stewards of land about Garlic mustard: Once the plant goes into seed production mode, it must be trashed, otherwise the seeds will mature even after the plant has been pulled. We have seen plants go to flower and into seed mode even after being pulled. 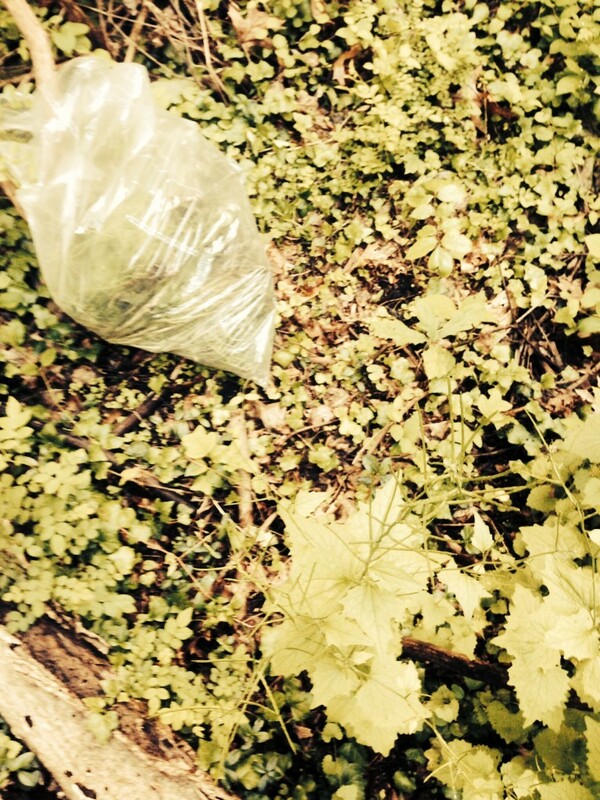 This from our observations of forgotten Garlic mustard piles left during volunteer pulling events. The plant, unfortunately, must be trashed. This is another reason it must be brought into control, that its eradication will effect the bio-mass of any given area. In our area of scope the only viable control is hand-pulling. There are too many native plants around that would be destroyed from any other conventional control methods. The hand-pulling can be an asset to those who care that much, because it allows a moment of pure observation on every part of the land of concern. The plant is edible, so go ahead and make yourself a salad from the leaves, or make a pesto. Of course the deer do not like it and they eat many of the native plants around it. It would be great if foodies got into it and Garlic mustard became a trendy new dish of wild salad or something. Maybe lovers of wild food could diversify their palette and move on from the current wild Leek craze that is threatening that native forest plant. Garlic mustard’s inviting aroma will draw you into the delicious world of this exquisite spring salad. Freshly selected from the wild, you will experience the crisp, nutritious greenery of early Spring. Mixes well with Arugula, and other spring lettuces.